Profusely illustrated. Fine copy. 4to, 211 pp., Translated by Jane Marie Todd. Used-Very Good. In 1990 the Department of Graphic Arts at the Louvre made their holdings available to guest curators for a program called 'Parti Pris, ' or 'Taking Sides. ' In this program, major cultural figures outside of the discipline of art history organized exhibitions based on the department's collection. Within its first several years, this novel collaboration produced exhibitions curated by philosopher Jacques Derrida and filmmaker Peter Greenaway. Jean Starobinski, noted literary critic and intellectual historian from the University of Geneva, was selected as the third curator in the program. In his exhibition and accompanying essay, Starobinski explores the theme of largesse in its broadest sense. Arguing that gift giving and receiving are fundamental human gestures, he examines graphic and textual representations from the offering of the apple to Eve to Salome's gift of the head of John the Baptist, from the giving of laws to the gift of death. Charity, the poetic gift, and the benefits of Fortune all play a role in Starobinski's extended meditation on the act of donation. 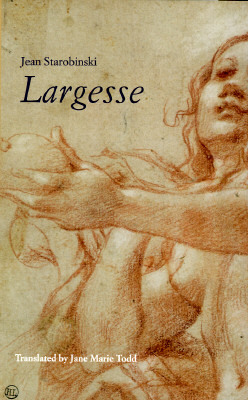 Lavishly illustrated and dazzling in its scope and imagination, 'Largesse' is an exemplar of the rich intellectual work that can result from crossing disciplinary boundaries and considering history as a dense network of themes and allusions. Very good. HC in like new cond, 4 to size, 1997 edition, "1" print, clean text, no marks seen, does not have DJ thus graded as VG.